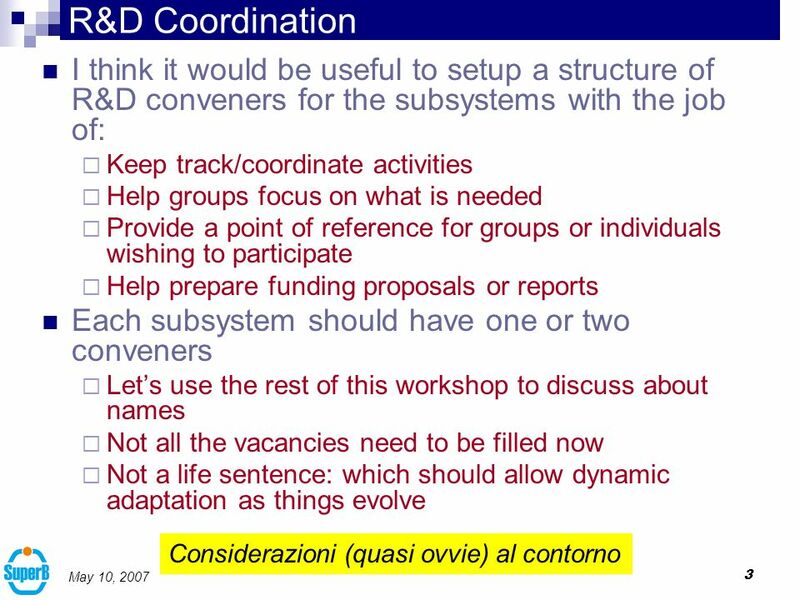 1 May 10, 2007 Detector group organization For the CDR writing we had identified subsystem editors/conveners This structure has concluded its function. 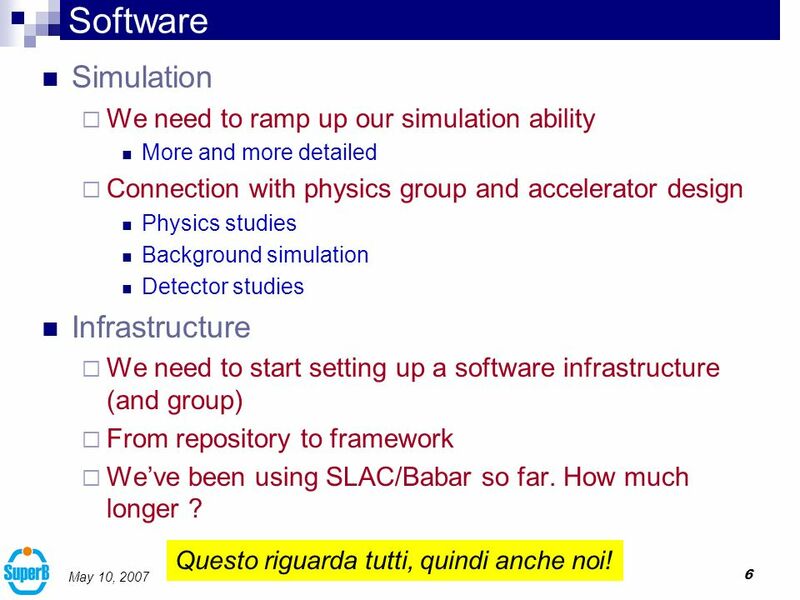 6 6 May 10, 2007 Software Simulation We need to ramp up our simulation ability More and more detailed Connection with physics group and accelerator design Physics studies Background simulation Detector studies Infrastructure We need to start setting up a software infrastructure (and group) From repository to framework Weve been using SLAC/Babar so far. How much longer ? 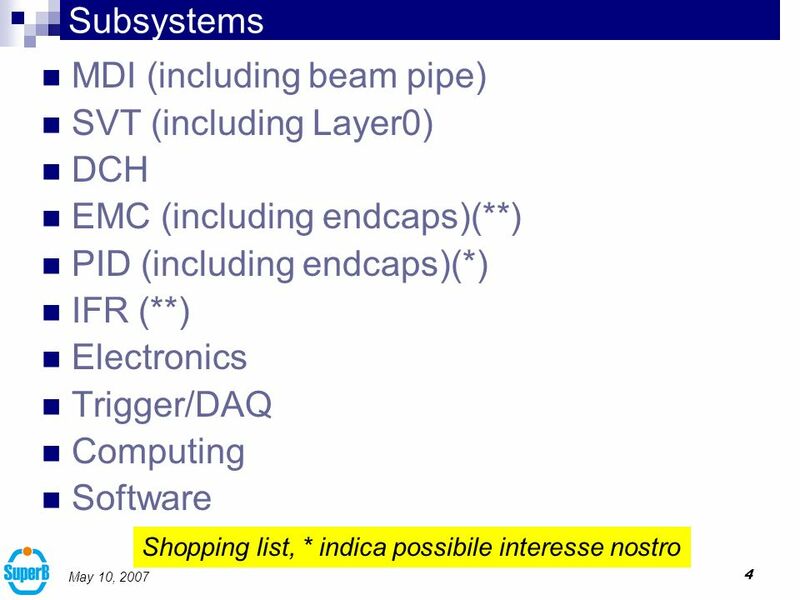 Questo riguarda tutti, quindi anche noi! 7 7 May 10, 2007 Last but not least Infrastructure in Tor Vergata We need to proceed with a feasability study for the Tor Vergata site It is essential to define building volumes and functions Experimental hall(s), support buildings and caverns, shafts, assembly halls, … We have regular meetings with the Tor Vergata engineers and architects Need input and answers from the Accelerator and Detector group Questo non ci riguarda da vicino, ma e vicino!!!! 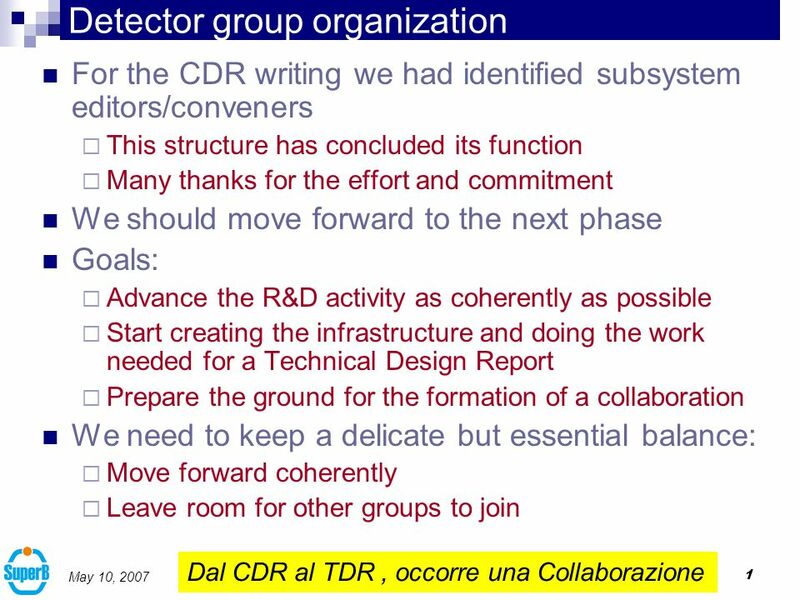 Download ppt "1 May 10, 2007 Detector group organization For the CDR writing we had identified subsystem editors/conveners This structure has concluded its function." E status report Alexandre Camsonne Hall A Jefferson Laboratory Hall A collaboration meeting December 13 th 2007. CDR Feb 2006Mar 2008Dec 2009 Mar Design Study Preparatory Phase TDR tendering construction data taking governance legal entity pre-production. DPG 2004 Köln C. Schwarz Particle Identification with the PANDA detector at GSI C.Schwarz, GSI. 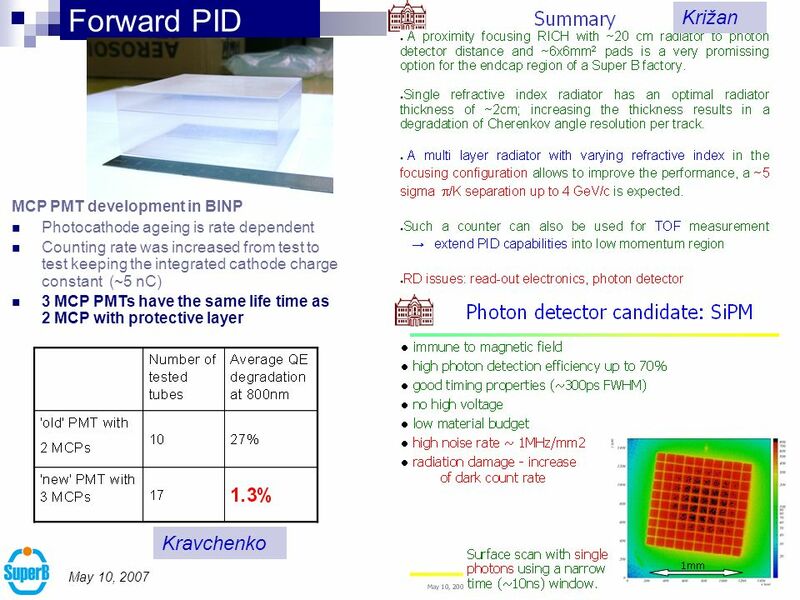 Barrel PID upgrade K. Inami (Nagoya-u) and PID group - R&D status - TOP counter - iTOP - Focusing DIRC - To do, cost estimation. 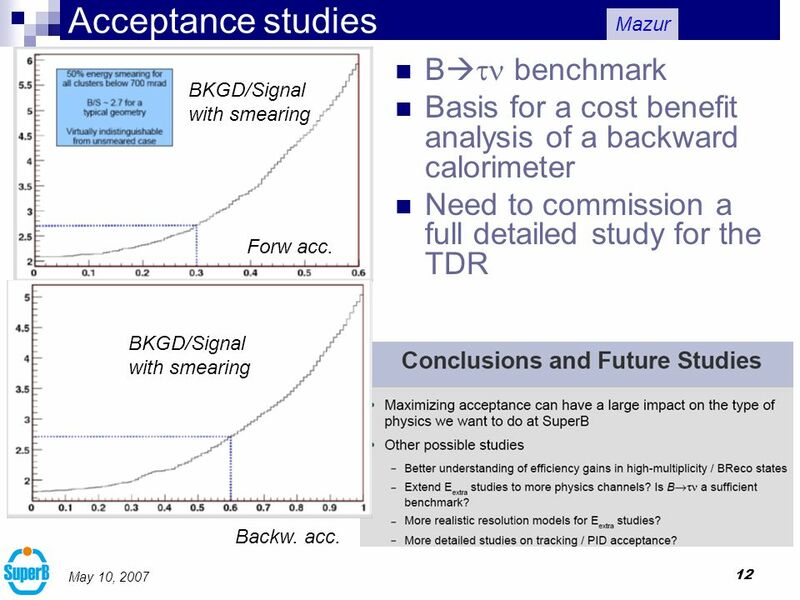 The LHCf experiment Measurement of Photons and Neutral Pions in the Very Forward Region of LHC Letter Of Intent: May 2004 Technical report: September 2005. 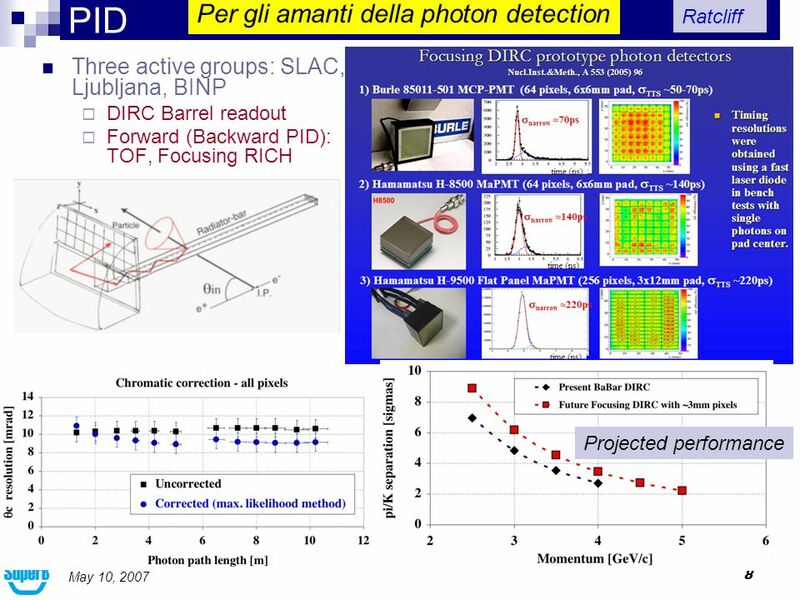 Blair Ratcliff, SLACSLUO Meeting, Sept. 18, 2008 Blair Ratcliff SLAC SuperB Detector Opportunities Overview Project Status Towards a TDR R&D Opportunities. 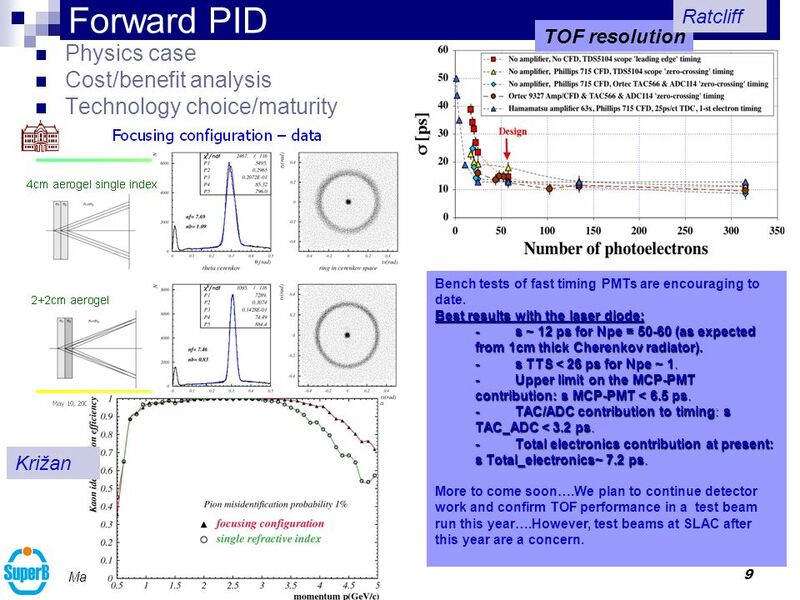 Blair Ratcliff5 th SuperB Workshop, Paris May PID Related R&D at SLAC: The Focusing DIRC and a Fast TOF Using Cherenkov Light. Blair Ratcliff Blair. 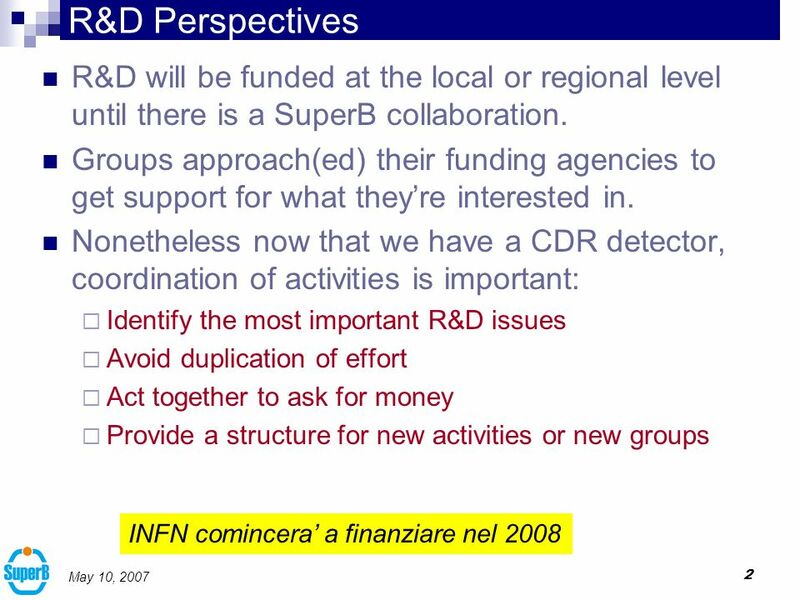 WP2: Detector development Summary G. Pugliese INFN - Politecnico of Bari. LBNE R&D Briefing May 12, 2014 LBNE R&D Briefing May 12, 2014 LArIAT and LBNE Jim Stewart LArIAT EPAG Chair BNL LBNE LARIAT-EPAG J. Stewart BNL T. Junk. 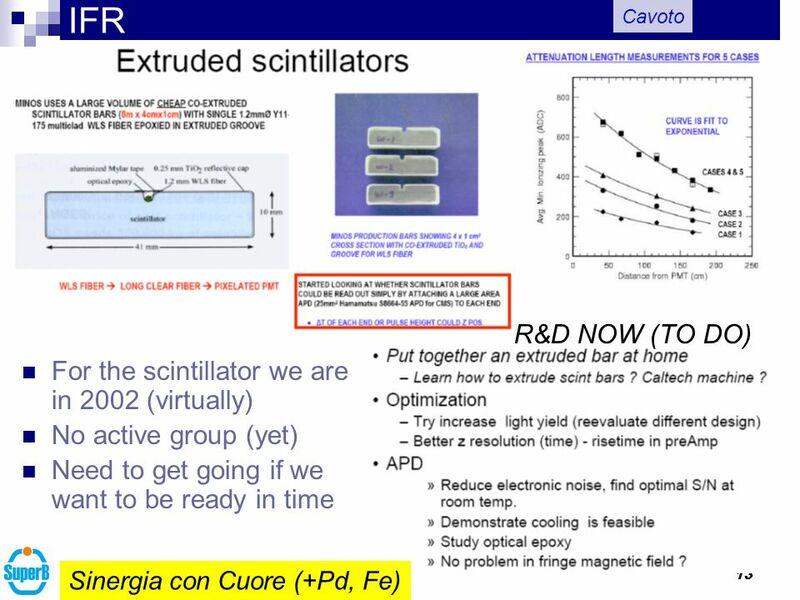 Carsten Schwarz PANDA June 2004 CID Cherenkov Imaging Detectors ● RICH software at HERMES, Ralf Kaiser, Glasgow ● Present status of DIRC, C.S., GSI ● Spiralling. 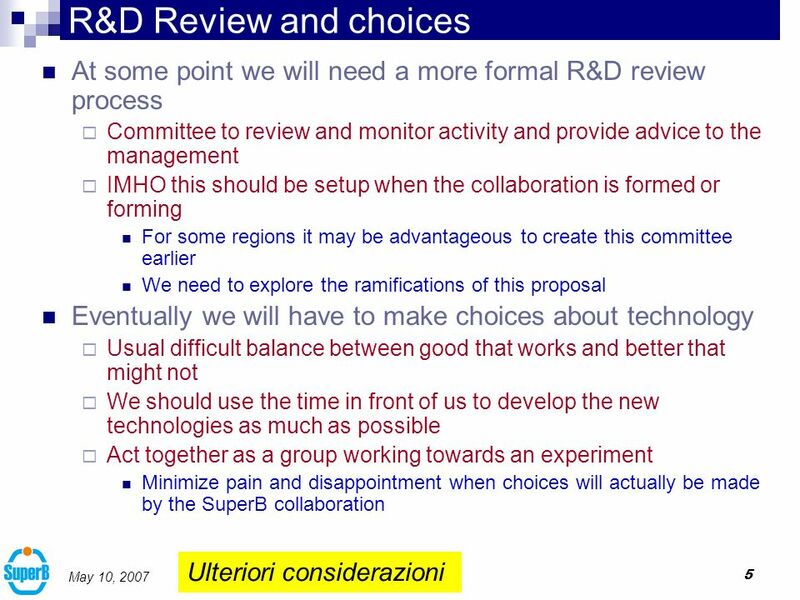 Peter Križan, Ljubljana March 17, 2006 Super B Workshop, Frascati Peter Križan University of Ljubljana and J. Stefan Institute Aerogel RICH and TOP: summary. NuMI NuMI Overview NBI 2002 S. Childress (FNAL) 14 March ‘02 NuMI / MINOS Overview. H. MatisTracking Upgrade Review – Dec. 7, SSD Update Howard Matis. 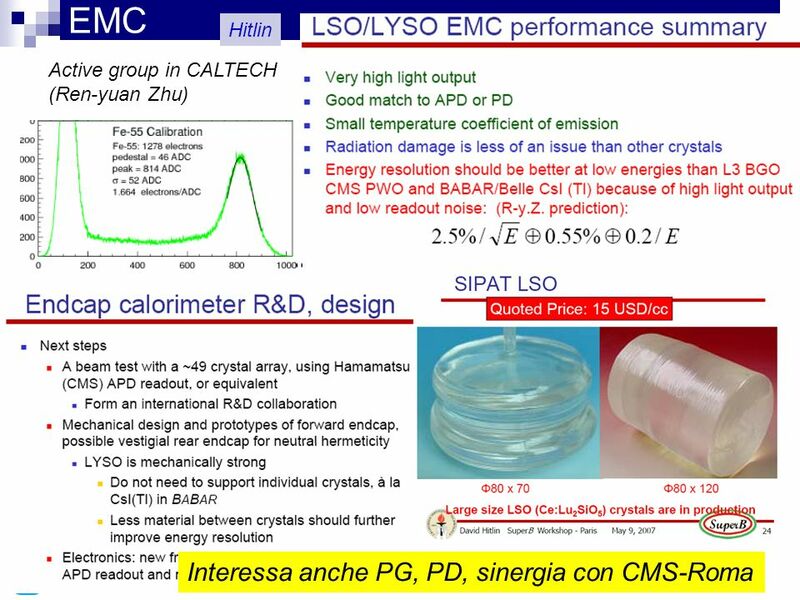 Blair Ratcliff, SLACUS R&D Meeting, Sept. 3, 2008 DCH R&D- Italy. May 31, 2008 SuperB PID sessionMarko Starič, Ljubljana Marko Starič J. Stefan Institute, Ljubljana Report on hardware tests and MC studies in Ljubljana. Tracker Neutron Detector: INFN plans CLAS12 Central Detector Meeting - Saclay 2-3 December 2009 Patrizia Rossi for the INFN groups: Genova, Laboratori.